Thursday 20th November 2008 - 10.30 am. The next auction at Simon Chorley Art and Antiques should bring some winter cheer to Prinknash with a varied selection of fine paintings, porcelain and works of art. The book section opens the sale with a selection of books by, or illustrated by, Sir William Russell Flint. Many of these are limited edition copies including examples signed by Flint himself. Lot 9 is a copy of ‘One Hundred and Eleven poems by Robert Herrick’ published by the Golden Cockerel Press in 1955. It is a luxurious sheepskin bound limited edition contained in a slipcase together with eight extra illustrated plates (est £250-350). The print section contains works by the modern British artist John Piper. Piper was an official war artist during WWII and laterbecame famous for his depictions of churches. Lot 24 is a screenprint of Penyfont Ford Congregational church and Lot 25 is a lithograph of Swansea Chapel (both est £400-600) and should arouse interest from Welsh buyers. Also in the prints are a large collection of works by Leslie M Ward, better known as the famous caricaturist ‘Spy’. Subjects include cricketers, jockeys and statesmen (est from £30-40). An earlier offering, Lot 48, is the engraving by James Basire of The Encampment of the English Forces near Portsmouth. This was produced in the 1770s from a painting at Cowdray House in Sussex, it shows Henry VIII in the foreground as the British and French fleets engage (est £500-700). Lot 58 (est £200-300) is a watercolour of pheasants by James Stinton, better known for his work at the Worcester porcelain factory, these watercolours are still widely collected. Of local interest is a portrait of the Cheltenham muffin man. JohnMillbanks stood 3’9” and his size was a useful marketing tool described in a poem of the time, ‘The dwarf was not a churlish elf, Who thought folk stared to scoff; He used deformity itself, to sell his muffins off’. This unusual and rather charming portrait is set to fetch between £120-180. The oil paintings include works from the 18th century and include the traditional and the more abstract. Country sports enthusiasts will be delighted by Lot 88, The Chase, a typical example of the work of John Nost Sartorius, est £4,000-6,000. One of a family of five successive generations of artists he is perhaps the best known. Another traditional painting is a well painted coastal scenewith fishermen and a donkey by William Shayer, est £6,000-8,000. Lot 102 is a little more contemporary and may arouse the interest of the Russian market. 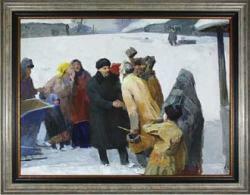 Depicting Lenin greeting the people in a snowy landscape by Russian artist Alexei Ivanovich Makarov, est £1,500-2,000. An interesting group of four silhouettes painted on glass, Lot 117 £400-600) gives us a window onto the world of Regency Edinburgh. 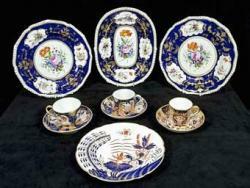 These are painted with domestic interior scenes and one is inscribed ‘Charles X crowned King of France 1825’. Charles X and his court spent time in exile in Edinburgh and these interiors are clearly those of a wealthy home with pets, musical instruments and figures engaged in leisurely activities. A large ceramics section has examples spanning the 18th-19th centuries, particularly the early 19th century, with examples of Wedgwood, Spode, Coalport, Worcester, Derby and Davenport. Of interest to collectors will be a cased set of six Worcester coffee cans and saucers decorated by Kitty Blake, dated 1926. Lots 342 and 343 are similar 18th century mahogany and brassbound plate buckets. Estimated at £700-900 and £800-1200 respectively, these are the perfect item for a grand dining room even if they are not used to transport the plates! Prinknash Abbey is offering another stunning item in this sale, Lot 346 is a carved statue with an identity crisis. The auctioneers believe that it is a statue of St George standing on a vanquished dragon that has been given a makeover in the form of outstretched wings which transform him into St Michael the archangel, est £2,000-3,000. A small but top quality clock section includes carriage clocks with estimates from £70 up to £1,500. The most interesting perhaps is the miniature mantel clock with jewelled hands, an 8-day repeating movement and marked Cartier, and contained in a gun metal case.This rather utilitarian case ensures a cautious estimate of £800-1,200. There is a wide variety in the furniture section and with the market weak for this material it is a great time to buy. A late 18th century mahogany and inlaid linen press, Lot 425, at £600-800 looks great value as it was most probably worth more in the 1980s. And, finally, for a stunning Christmas present, Lot 297, is a diamond pendant shaped like a snowflake, est £2,500-3,500.